Excuse the expression please! This was my fave hair shot! 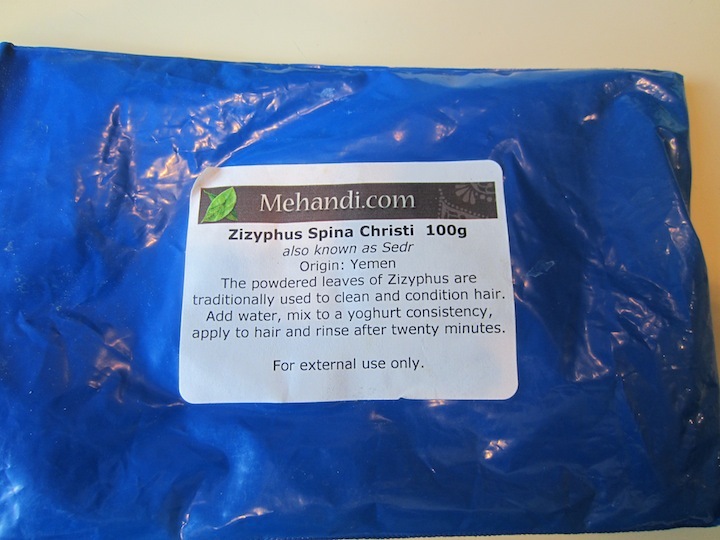 I decided to do my second ever treatment with Zizyphus Spina Christi (ZSC) this weekend. You see, my curls were looking far more like waves and even those were pretty lackluster. This is how crazy it looked Saturday after being bunned for the morning. Last time, I mixed about 50g of ZSC with a cup of water and it was far too much. So, this time, I started with 25g and 1/2 a cup of water. ZSC doesn’t mix as quickly as henna; the powder kind of beads as the water is introduced and stirred into it. But then, when it does begin to absorb the water, it more than doubles in volume and becomes thick, like the consistency of melted marshmallows! It also foams, due to the saponin I learned this weekend. However, despite the increase in volume, I didn’t think that I had enough to coat my hair, so I added another 1/2 cup of water. The instructions indicate to mix it to the consistency of yogurt, my yogurt was a little watery;). I left it to sit for a few hours (the online instructions indicate about 2 hours, but it ended up being longer than that by the time I got around to applying it). So, I finally got around to applying the ZSC late Saturday afternoon. I had finger detangled my hair on Thursday night to put it into twists and wore the twist-out in the second picture to work on Friday. So, I didn’t finger detangle prior to applying the ZSC. I also didn’t feel like pre-pooing this weekend, so I applied the mud to dry and dirty hair. First, I sectioned my hair into four and secured three of the sections out of the way with round-tooth jaw clips. Then, I squished the gloop through my hair section by section. By the time I got around to the last section, I realized I was going to run out of the paste. So, I quickly made a little more and finished coating all of my hair (figured I’d have to live with applying it freshly mixed to the last section). This mug is a b@#$ to rinse out!! Ughhh. I mean, I knew it was … I didn’t forget … shoot, that’s why I hadn’t done it again since September. I was flicking twigs and flakes out of my dry hair for three or four days after my last treatment. Anywho, I hopped in the shower and commenced to rinsing with hot water. 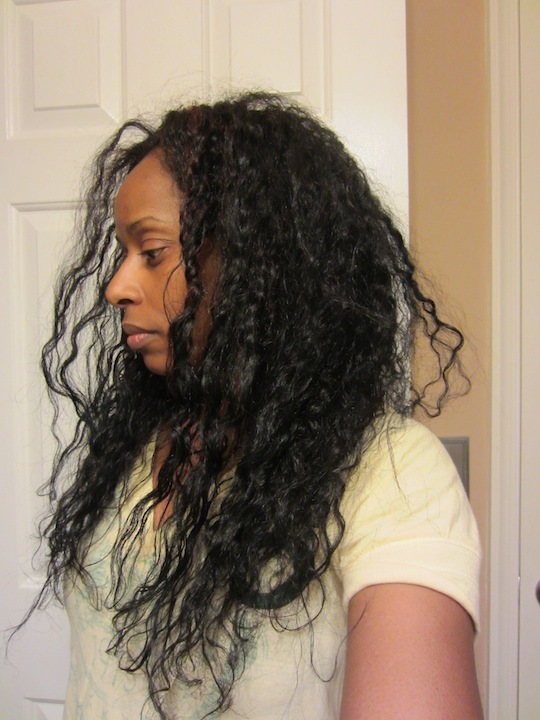 I continuously ran my hands and fingers down the length, slowly detangling and loosening the hair to allow the water stream to get into all the nooks and crannies. I guess I was at it for about 15 minutes. Then, I hopped out of the shower and applied my DC, which was Shea Moisture Raw Shea Deep Treatment Masque mixed with about a tablespoon each of honey and EVOO. There were definitely flakes in my hair still. But, I baggied it anyway and threw on my Hair Therapy Heat Wrap for about an hour/hour and a half. It was probably around 10 p.m. by then, so I ended up going to sleep with the DC in my hair (I really want to stop doing that, but it was late and I was so tired again!!). The next morning, I got the last bit out of my HE HH by adding water to the bottle, shaking it up and pouring it over my DC. Then, I rinsed with warm water, then cool in the kitchen sink using the sprayer. I rinsed for another 5-10 minutes, I guess, to try to get the remainder of the ZSC out of my hair. I allowed it to air dry to barely damp and finally styled with a modified Kimmaytube leave-in (1 tsp or so of oil instead of 4) and a new styling product that I’ll reveal shortly *evil laughing* … “BWAHAHAHAHAHA!! 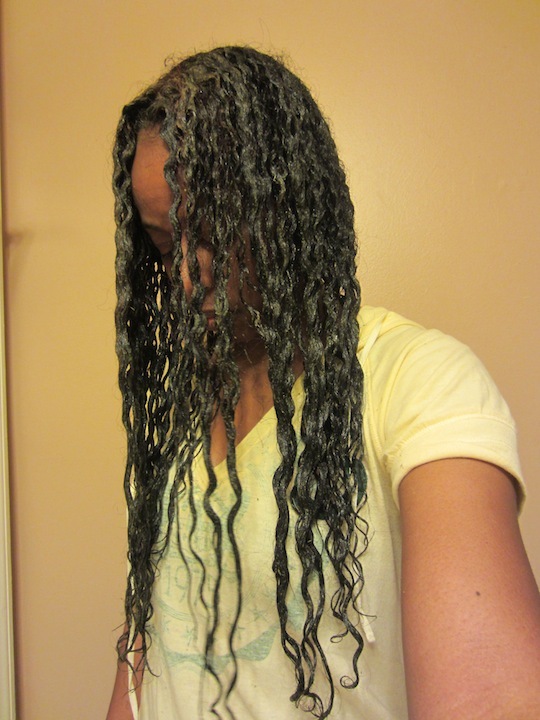 !” Once my hair was dry (ummm … mostly … it just takes soooo long), I used a little JBCO/EVOO to seal and soften it. And voilà! I was pleased with the results and these pictures don’t even do the volume justice. It’s big! LOL! Also, although I do see a speck here and there, I don’t look like I have a bad case of dandruff this time. Keeping my fingers crossed that I won’t be pulling an Ally Sheedy making it snow at work tomorrow!! LOL! Now, although I get good results with ZSC, I don’t have any plans on re-upping just yet. I’m hoping that the Terressentials will be just as effective without the half hour rinse cycle and pesky twigs and grit! Anywho, here is a slideshow with some additional pictures. Now, I’ll probably be wearing my hair out today, but hope to put it into twists tonight. We’ll see if I can squeeze that in between putting together posts for Tuesday! How do you get your curls popping when they are barely peeping ;)? LOL! I ordered it from mehandi.com. I can definitely see the difference. It looks more voluminous and shiny. So the Terressentials is supposed to have the same effect? Didn’t know that. Yes Rece, at least, that is what Terressentials is supposed to do by cleansing hair really well without stripping. 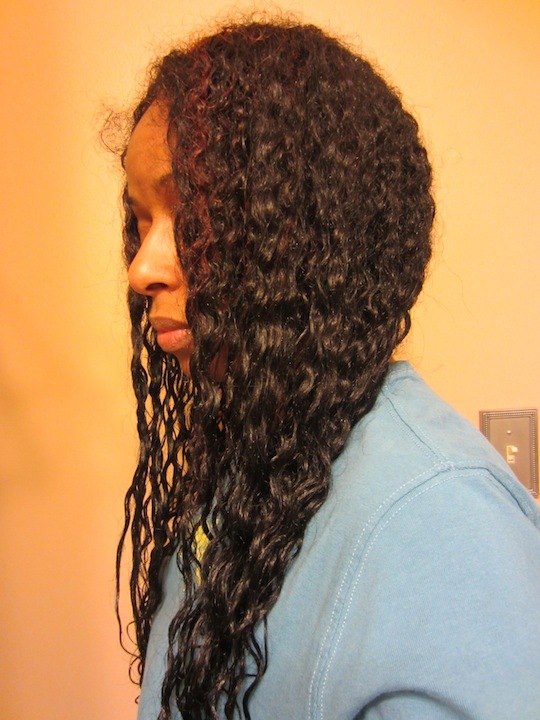 It’s also supposed to make detangling a breeze without the need for conditioner. Now, the thing is, the base is bentonite clay. I did a bentonite clay mask one time and wasn’t impressed by it. So, we’ll see how this works with their secret blend;). And girl, right?? I can NOT wait until it’s all back to normal!! I really do feel like it looks like I’m transitioning sometimes!! I’m scheduled for a trim next month, so taking off about an inch to get rid of some of the longer and straighter ends. Both curl patterns are nice. It’s not THAT obvious, I just know because you’ve mentioned it before. I still have tons of Zizyphus left. I bought alot LOL. i love it but since its so hard to rinse like you mention I’m a bit lazy putting it in. But yes I concur. The results are pretty big nice hair. I’ll wait on your review of Terresentials before I jump on that band wagon. The twigs in my hair don’t bother me as much as long as I get those results LOL. 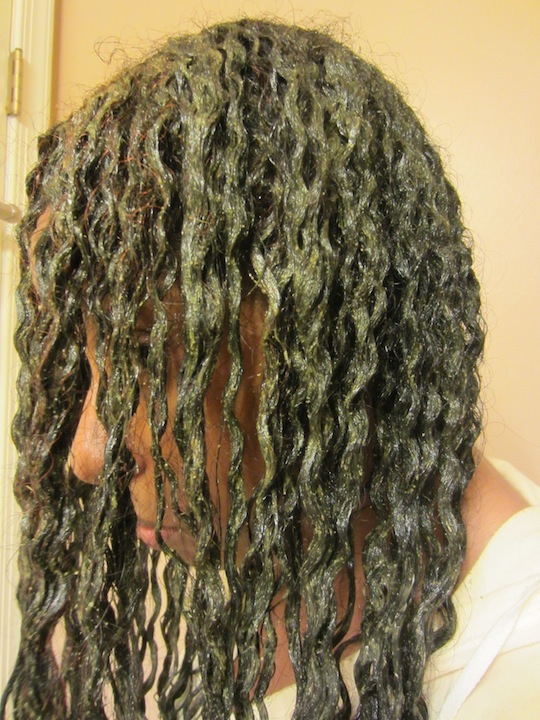 Oh by the way I don’t cover my hair with plastic cap using Zizyphus because the instructions didn’t say to so… However, i let it sit for an hour and it didn’t dry in my hair. Yeah, we’ll see how that goes!! As to the ZSC, I didn’t see that they said use a baggie either. But that stuff was drying on my face quickly and I was afraid of how bad it would be to rinse if it DRIED at all given how difficult it is to get out wet!! LOL! Thanks Candice!! No, it’s not heat damage. If you go to my FB photos, there is a Sofistafunk & Friends album. My hair is down and you can see the difference there. That was in September, well before I got it pressed. The change in texture at the bottom was due to gung ho hennaing in 2010. 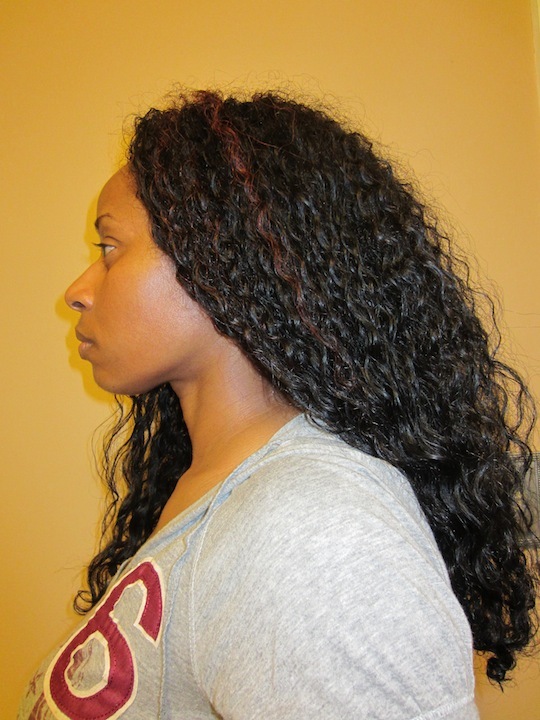 In 2011, I stopped doing full length treatments and reduced the frequency to 1x a month. As my hair grew, started to see how much henna had loosened it. Yeah… what product did you use?!?!?! I was so inspired by this post I made an order at mehandi.com. I will be trying it this weekend. I hope that it works for you Yami!! 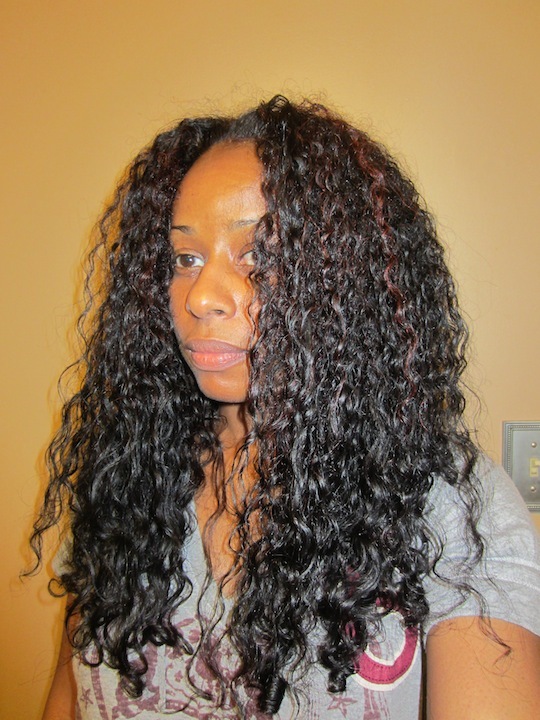 I can’t wait to wash my hair this weekend as I remember it get even fuller the second wash after the treatment!! Wow! I’d been wondering what that stuff is. Your curls are really poppin now! Wow! I’ve been wondering what that stuff is. Your curls are really poppin! 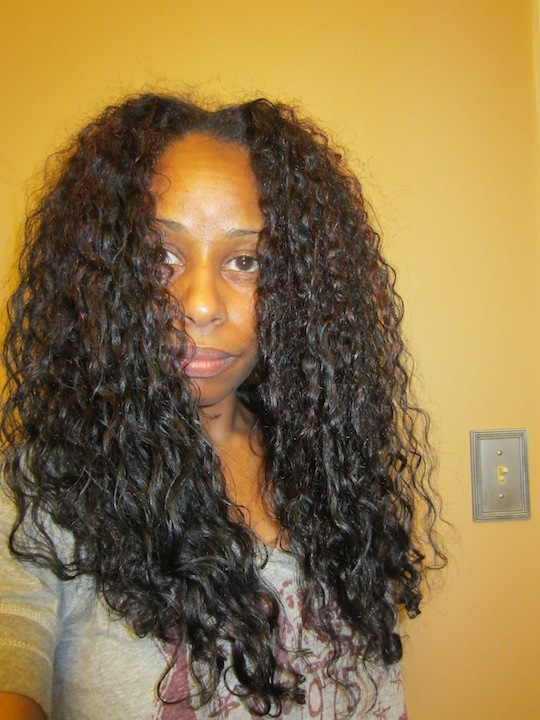 Hi, could you tell me how long do the conditioning and volumising effects of ZSC last? Only to the next shampoo or some months like Cassia? Thanks Alexis. I’d say that it lasted a couple of weeks. That’s about all cassia lasts. Henna lasts for 6-8 weeks and the color is permanent. I was wondering can I use this product if I’ve had a perm before?